Measuring rain the easy way: using an automatic logging rain gauge | Watts Up With That? In that post I had a picture of the standard rain gauge used by Cooperative weather observers in the USA, shown below. One of the downsides to the cooperative observer network is that fact that you have to read and empty this gauge manually each day, and if you miss a reading, you get a cumulative total of a days and no way to figure out what the previous days reading were. A dipstick is used to get the rainfall reading. Some observers I spoke with during the surfacestations.org survey indicated that if they missed a reading, sometimes they’d “fudge” the reading by going back to the local newspaper or other weather stations online nearby to get a reading. I should mention that most observers are very diligent, but stuff happens. People get sick, they get called away by family or business. It is inevitable with such a labor intensive system. 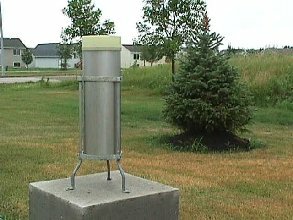 NOAA recognizes this problem and on some (but not all) stations they put in a Fisher & Porter automatic recording rain gauge like the one shown below. Amazingly, it uses an old paper punch strip recorder and the data must be run through a 60’s era tape reader. The description from NOAA below describes the process. When I visited NCDC in April 2008, I was told about a crisis that developed over this old apparatus. It seems they can’t get the supplies for the mechanism in it anymore and the paper punch rolls were becoming hard to get. I heard later they had a third party company create a solution; a rebuild kit which you can see details on here (PDF). It isn’t cheap. I’ve heard the cost to be over $1000 for the rebuild kit. Given what you can see in the NOAA FP rebuild procedures manual, it is easy to see how it could cost so much. I sure travel and labor charges alone add up to about the same as the cost of the equipment, assuming that cost is correct. But as we know, the government can pay exorbitant amounts of money for simple technology, like hammers and toilet seats. For anyone that might be interested, I have engineered a solution that is small, portable, and quite cost effective. It is also calibrated and NIST traceable. 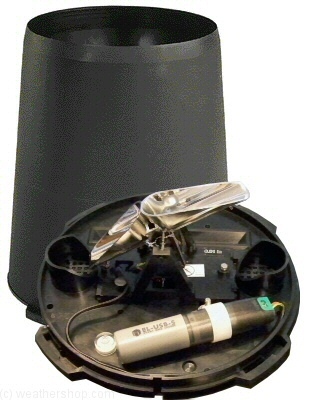 This unit can be placed anywhere, and log rainfall data for up to a year using the self contained data logger. Simply plug the data logger into the USB port of your Windows PC to download, graph, and export the data using the software provided. Units come pre-assembled and tested from the factory, ready to deploy, no assembly is required. Mounting screws and leaf/debris strainer is included along with a mounting/placement guide. Tipper unit is locked with a strap during shipping to prevent damage, and can be cut with a scissors or knife prior to deployment. Functionality of the datalogger unit in the field is indicated by flashing red and green LEDs, with an option to flash the red LED every time an event occurs. Datalogger includes special datalogger software on CD ROM, waterproof cap, long life Lithium battery which allows logging for up to 1 year, and manual. At $199 USD, it is much more affordable. Details here should you want to get one. If you ever wanted to monitor rain at a location but can’t be there all the time to check it, this unit could be a solution. ← Technical paper training for "Hansen's Bulldog"
That look really great !!! I’ve always had a question about rain gauges. Are their measurements affected by wind? Ultimately, with a really strong wind, the rain is almost horizontal; how does that rain fall into the gauge? It would be possible to place a rain guage on a gymbol and control it to face its mouth always into the direction of the rain. Steven Mosher, did you catch all that? Too simple and easy to use for government work. Add a zero to the price and sell it as designed for government use. Be sure to add a zero to the model number and add useless verbage to the instruction manual for the government model,. You can then contribute to resolving California’s debt crisis. Congratulations, Mr Watts, what a nifty and elegant innovation! Let me know if you are thinking of logo/brand and have no one…I feel I owe you for the many hours of entertainment on this site. I dare say the price is way too low for your government, given how they associate being bilked with getting a proper product. Let us know too what hoops you have to jump through to compete…frustration for you and a bit of head-shaking for the rest of us, assuming you can keep your good humour! As for the old F&P gauges – I bet Willis could make a useful boiler out of them. spillage and the rain amount indicated can be off by a large degree. Still love you gauge though and would purchase one someday. Oh raid drops let me count thee. What is the minimum sample time? I have a use if it can do sub-minute or even one minute samples. Anthony….. You are such a wonderful and delightful embarrassment to our government! Brilliant and pitbull tenacious! I’d gladly catch a bullet meant for either you or Steve McIntyre, anytime, and die in your arms. …..smile. If you want an agent selling to the feds, I’ve got a company with a 30 year pedigree and all the govt stamps — plus four times the face value of any PO toward meeting SBA purchasing goals. NOAA would swoon! And, you wouldn’t have to talk to nobody. ….smile. In Australia this type of rain guage has a problem with birds sitting on them and crapping inside, so they have to be cleaned constantly. As someone mentioned, there could be a maximum rate beyond which overflowing will mean a lower recorded figure – do you have any data for that? That is, what is the maximum rate that can be accurately measured? I am also interested in how it would handle very light events – i.e. what happens when it only tips over once every four or five data-logging points? Will this cause strange readings? I guess rainfall at this level this will be so low as not to really matter and I expect the bucket size is chosen as a compromise between these two extremes – maybe there is an option for either altered bucket sizes and/or narrower neck collection vessels to “tune’ the device for different expected rainfall. But, to be fair, these are exactly the same issues in all rainfall measurements – if the rainfall is so heavy that the bucket fills before you go and measure it, you underestimate. Similarly, evaporation will affect rainfall figures on dry days so there will always be a lack of accuracy at the extremes. What I like about this is the very simplicity of the data collection – count the bucket-tips in a time period. Something machines (electronics) can do much better than reading a scale or even weighing (scales need calibration). Sadly, I have no use for one of these, but part of me wants to buy one – just for the fun of it! In Guam we sometimes have little Geckos running in the gauge or junk from the Geckos or other tropical debris blocking the hole for the gauge. When you have a remote gauge it is hard to clean it out as oftern as you would like. We sometimes will get a few inches of rain in one observation as the junk cleared out and all went through the gauge all in one shot. Again don’t get me wrong, tipping bucket type sensors are great, but their limitations need to be considered. I find the birdcrap to be less of a hassle than spiders who like to prevent the bucket tipping action with their webs. Bifenthrin helps, but you need to reapply from time to time. It breaks down quite quickly even in our relatively weak Tasmanian sunshine. Maybe I should paint it black since mine is made of translucent plastic. What I like about mine is the remote sensor so I can check the results from indoors. Data-logging would be cool. Anthony, the documentation requirements will kill you. The FAA was using onion skin weather charts at their Flight Service Stations when every TV station in the country had computer graphics displays. The only way they got decent weather map displays was for the regions to go out and buy them themselves. Weather service- even worse. I’m still surprised that they ever got the NEXRADs deployed. I worked with the Program Office (JSPO) on the procurement and it was sad. Anthony, have you done comparative data collection to standard analog gauges to test the accuracy of this digital set up? If we can get Zigby to your electric meter, why can’t we put zigby on these instruments. Our average precipitation for the year is about 8 inches and not nearly as exciting as our wind. However, your rain gauge might be useful in large gardens, orchards, and vineyards where sprinklers are used. Even better if there was an automated “alert” to shut off and/or switch to another block of crops. Unfortunately that automated solution is too cheap. As we learned from the thread on the Sandwell wind turbines, the real cost is in the government decision-making, product specification and qualification, and the installation. An inexpensive instrument makes the rest of the process look too costly by comparison. As others have pointed out above, if you want to sell to the gub’ment, add a couple of trailing zeroes to the hardware price. The bird poop is not a trivial issue – I’m having it with my Davis gauge of a very similar design. What has been happening is that the poop isn’t enough to totally plug it, but the collected rain drains much more slowly. Haven’t seen spiders in it yet like I did in my plastic gauge all the time, though. But the requirement to empty it daily also required visual inspection daily too. One solution for the tipping bucket design is to put a ring of spikes around the rim of the bucket, closely spaced so the birds can’t fit between them and pointing upwards so that you’re not just providing more perches. If you use metal spikes and have a nearby outlet, you could wire alternating spikes as hot and neutral, thus providing cooked snacks while defending your gauge. Rain here is usually very light. And with very low humidity, was just 10% RH a couple days ago. How does a tipping gauge respond to that? When we get snow, most of it evaporates rather than melts. Ground fog. Does the thing work in very cold conditions? Of course, we also get the once in 20 year “gully washer”, 10+ inches of rain in a few hours. Haven’t had one in quite a while, back then the water in my street was over a foot deep. And I live on a 7% grade. White water kayaking, anyone? This isn’t really about this topic, however, being that this is the most recent post. Can you guys get any info as far as the radiation levels are concerning water, food and of course air levels in the United States, or elsewhere? It seems this information is extremely hard to find, or else it is old, and in data-sets that I can’t make heads or tails of. Looks like a nice compact self-contained tipping bucket, great for getting rainfall times and rates. But like the other designs of rain gauges, it has its limitations. The biggest is that it can’t measure snow water equivalent. I’m the co-op observer in a place where more than half the annual precip. falls as snow, so that would be a major issue. I do have a LaCrosse tipping bucket with a plastic funnel that is set up in the summer but comes in during the winter. Another tipping bucket (US Govt issue, left over from some 1970s cloud seeding experiments) has an 8-inch metal funnel, so I can heat it with a couple of 60-watt light bulbs inside. That melts the snow as it falls, but it also evaporates some so snow water equivalent is underestimated, especially for light snow during cold weather. Two other rain gauges, the CoCoRaHS 4-inch plastic gauge and the cheap (but effective) wedge gauges are also good for cathing wind-blown rain and snow and for swapping out when they fill with snow (since they’re cheap, I have several of each). But the gold standard remains the 8-inch metal gauge, which can hold two feet of snow or rain, is deep enough that hail doesnt bounce out, and has a large enough opening to get a representative sample of the falling drops and flakes. But it does suffer from evaporation when the sun comes out and heats the copper, and it does have soldered seams than can leak sometimes. So what’s the bottom line? I have at least five gauges out at all times, each of which has its advantages. Usually they give similar numbers, and when they don’t, you figure out why and determine which number is the best. If I didn’t have two tiping buckets already, I’d get this one! I used to have one of those rain gages, but my uncle “borrowed” it and turned it into a smoker. You’d wind it up and tape a piece of paper on a drum that would take a week (I think) to make a whole revolution. The scale would depress an ink stylus which would make a continous trace of the weeks cumulative precipitation. I also have a recording barometer that works the same way. I hide it away out of site when my uncle visits. I bought a tipping gauge (different brand TESA) with wireless signal to a meter which collected hourly, daily and weekly cumulative readings. First thing I did was to calibrate it – the instructions did not say how it worked. I measured everything, I weighed water on analytical scale correct to o.oo1 gms and then put the weighed quanties through at different rates for different lengths of time up to 2hrs. I counted the number of tips and timed when the signal was sent. I found that the program had the bucket capacity wrong. The program assumed each tip to be 0.3mm instead of the actual 0.4mm. I also found that sometimes tips were not counted. I then set up my manual gauge which I had calibrated previously -accurate to 0.5mm at all reading levels, beside the automatic one. I compared readings reading daily, always at identical times for over 6 months. I had hoped to obtain a usable factor to correct the automatic readings but no chance. The factor varied on a daily basis from around 1.16 medium rain (5 to 10mm per day) to over 3.0 for low rainfall ( 0.5 to 2mm per day). In the period there was one day with 96mm and a factor of 1.46. The factor became worse after a few month so now I have given it away and only take manual readings. Anthony, your instrument no doubt performs better than the one I wasted my money on but I do think calibration is necessary and there should be instructions which mentions full details of how it works, an error table and things which could go wrong eg loss of battery power. Rainfall levels are probably more difficult to get accurate than surface temperature. One flash flood I have looked at, Boscastle, Cornwall, UK. there were two gauges in the catchment differing by 5ins over the flood period, these were 2 miles apart. So getting an area rainfall figure is fraught with problems. Still looks a nice instrument. Nice Unit. Automated Wireless transmission would obviously make it even better. My father has a similar device as part of a radio linked home weather station. He has it mounted next to a conventional plastic calibrated jug gauge, and the two have been remarkably comparable to each other in readings. Occasionally very light rain will cause discrepancies, and the spider issue mentioned above is certainly one we have encountered, along with small parts of leaves & debris which get past the screen. This may be more relevant in our typical domestic setting – at a more remote location it may not be a problem. 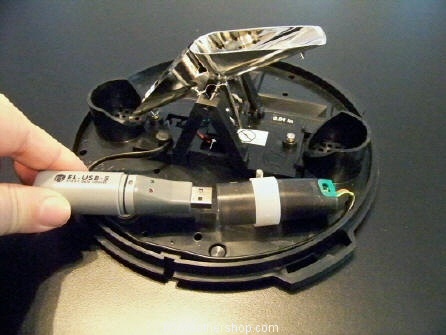 In our example I would not expect such a device to work reliably for a year without some regular checks and cleaning. In low precipitation areas, evaporation issues can be ameliorated by putting some low volatility oil in the collector. That’s a conventional rain gauge, obviously. It’s what we did collecting “seasonal” rainfall data in Oz. Gauging rainfall (quantity/rate) is horribly problematic. I think this is the Davis gauge. I bought a gauge like CoCoRaHS uses and put it on a solid fence. The difference was about 10%. The Davis gauge has adjustment screws, and several tweaks (done by putting measure weight of ice in the funnel) later they were usually pretty close. One thing that is really important is to install tipping buckets very close to horizontal. If they tilt around the bucket axis, that’s like major changes of the adjustment screws. Note the bubble level on the base of Weathershop’s unit. When I joined CoCoRaHS I won another gauge as the door prize and mounted it close to my Davis setup per CoCoRaHS instructions (2 feet off ground on 2×4 with angled cut to prevent rain splash from entering the tube). I was surprised at the differences between the two CoCoRaHS gauges in windy rain storms and now appreciate why they look down on fence mounts. They also don’t like tipping buckets in general, but are happy to get reports of rain rates through whatever means available. All in all, I’ve been impressed with the efforts CoCoRaHS makes to get accurate data. I haven’t had bird poop problems with my Davis gauge. I do have problems with leaf stems and icicles sticking through the bottom and interfering with the tipper mechanism. The main symptom is the base station reports rain at 13.5″ per hour. I suspect Weathershop’s will stop recording until the blockage is fixed. It’s pretty easy to make a case for having both units. Of course, for remote logging, this tipping bucket wins hands down. It would be great for research studying watersheds bigger than the typical thunderstorm. CoCoRaHS was setup after a flood in a canyon in Fort Collins, Colorado from a thunderstorm that wasn’t measured by any NWS sites. They’re more interested at present in a dense network of observers than a long term record. They also love snowpack measurements to help with spring flooding forecasts. I work for the NWS. The government already uses tipping bucket rain gauges at all “official” observation sites. They are not without problems. We spend time having to quality control their data. 2) Dew tips. These occur when enough dew forms to cause a tipping of the bucket. Dew by definition is not precipitation. 3) Wind tips. This occurs if the bucket is almost full, but hasn’t quite tipped over, but a gust of wind occurring well after the precipitation has ended finally pushes it over. 4) Bird poop. Loves to clog the rain gauge up and has to be manually cleaned out. A partial clog will cause a slow drip over hours if not days and can often go undetected if someone isn’t paying close attention to actual start/end times of precipitation. 5) And my personal favorite. The story of a field mouse nesting inside the gauge and running back and forth on the bucket causing sporadic reports of precipitation. That was a fun one to figure out. And of course snow, sleet, and ice reports are terrible if not impossible. When it comes to measuring precipitation, nothing beats a standard 8-inch diameter gauge with a dedicated human to measure it. There is a push of automating all cooperative observation stations with tipping bucket gauges. The data quality will plummet! I’m skeptical of data from any one automatic anything gauge (and don’t get me started on auto snowdepth readings). Usually auto rain gauges are OK right after setup. Then the spider webs and bird droppings start accumulating. Also, electronic and mechanical stuff tends to go out of calibration after a while. I’d be more trustful of a situation where you have 4 recorders in one location. If one sensor goes berserk, you could usually tell, compared to the other 3. If you only have one, you don’t know whether it was a heavy isolated thundershower or garbage data. Auto station data is a pain to QC. BTW, some Canadian autostations send the minutely data (precip and sunshine field “RF1”) in a package with their hourly reports, and it is archived, but it wan’t being heavily QC’d when I retired. I also work for the NWS, at a River Forecast Center. Most river gage sites have tipping buckets connected to data collection platforms that telemeter via the GOES satellites hourly. Part of my job is to QC over a thousand tipping bucket gages hourly for input into radar precipitation estimation corrections. As mentioned earlier, clogs and partial clogs are a constant problem. Dew will form on the funnels first, and if next to a dusty environment such as a gravel road or a farm field, the dust interacts with the dew and slides down to the funnel neck, creating a very effective adobe plug. Spiders build nests inside, which interfere with the tipper movement. Blowing leaves collect to create partial plugs, so as mentioned above, a one hour rain storm may dribble out for hours or days after the event. Dirt collecting in the buckets can cause over-estimation. Mast-mounted gages can be knocked out of level; they must be exactly level to be accurate. During high rain rates, water is lost during the transition from the full tipper to the empty tipper. Long term climatologies show tipping buckets collect about 70% of what a co-located 8″ standard rain gage collects. Tipping buckets, whether heated or not, don’t work worth diddly in snow, which is a significant amount of yearly precipitation for the northern portions of the country, and which often causes significant and prolonged snow melt flooding. Knowing the amount of water accumulated from snow is critical to accurate flood forecasts. For that matter, unattended automated weighing gages at the Local Climate Data airport sites can under-report in extreme events such as a foot or more of wet heavy snow, when the funnel heater can’t keep up and the snow bridges the funnel and additional snow blows over the top. On the other hand, there are about 20 Fisher-Porter gages in the Middle and Upper Mississippi Valley which have telemetry, and have observers available to remove the funnel for snow events and install the funnel for rain events, and these Fisher-Porter gages have measured the heavy snow events quite nicely and are quite comparable to the 8″ standard rain gage reports. The Fisher-Porter network is in the process of having all the mechanical linkages, punch tape and springs replaced with a load cell and datalogger. Units that have been upgraded have shown a drastic decrease in maintenance and lost data. One major deficiency in the COOP network precipitation gages is the lack of wind screens. Research has shown wind above 10 mph has a significant effect on the catch of unshielded gages, particularly during snow. Check out http://ams.confex.com/ams/90annual/techprogram/session_23952.htm Very few gages outside the ASOS network have wind screens. If one could obtain quality all-weather precipitation data for $200/gage, I’m sure the NWS would jump up and down with joy, as budgets are always an issue. But, the unattended all-weather precipitation observation problem is more complicated than that. I have been using a standard 8″ gage since 1952. If I am not around to measure I get someone to do it. Next to it I have a automatic tipping bucket gage. If a heavy intensity precip occurs the tipping bucket cannot keep up. Also, as mentioned before, birds, spiders, leaves, snow (if not heated) clog the gage. The good ole reliable 8″ is the way to go. the location of the gauge is or paramount importance. not just to miss the rain shadow of a building… but the larger view. i worked at a certain place in the los angeles area for about 30 years. during this time i drove a certain freeway about 15 miles each way 5 days a week. over that period of time i observed that at one intersection between freeways it very rarely rained. at another about three miles away, if we would get any rain in the LA basin it would be at least foggy and probably be raining there. there was also the appearance that in the los angeles/long beach harbor there would be rain in the small hours of the morning that would not be noticed by the rest of the town but we would see roads washed clean, parking lots with puddles and when asked about it the graveyard shift would say “yes it rained heavily for about a half hour about 0400 this morning”. has this kind of thing been addressed? i worked for the same overall outfit and when the question of what equipment we should buy for barcoding (reading) i suggested that we go down to the local grocery chain and talk to them about what was the best at the time. i was allowed to leave the meeting with only 30 lashes with a freshly salted whip.